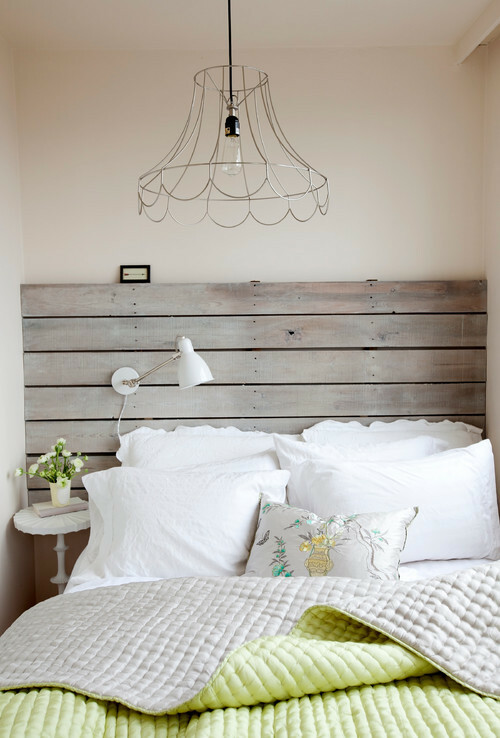 Need some headboard ideas for your bed? While most people focus on the linens, the right headboard plays a starring role and telegraphs your home’s style. “A bed’s headboard is the room’s anchor and a key component to the layout,” explains Drew Henry of Design Dudes. Many homeowners opt for a traditional piece of furniture with a headboard built into the frame. But this is hardly the only route to take. 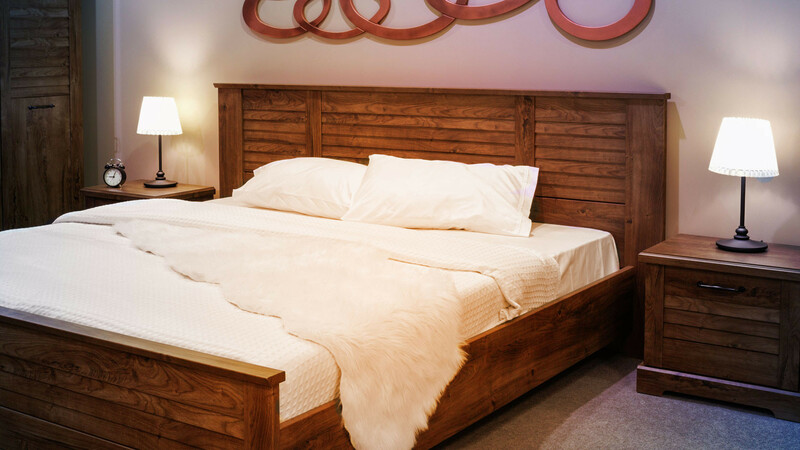 “It’s fine if you locate the perfect bed and headboard combo, but if not, you can easily customize,” Henry says. Before you shop (or craft your own), consider your style. Angular, clean lines are a smart look in a modern home, while boho homeowners may lean toward curves that recall a Moroccan archway, says Jason Oliver Nixon, an interior designer at Madcap Cottage. “Or try an English vibe with a tufted board in chintz or a more clubby gents’ library feel with leather and exposed nail heads,” Nixon offers. Your goal? Combine the right support you need in bed with a creative headboard solution to take your bedroom to the next level. Here are eight fun ideas to perk up your nesting spot. Rustic wood, whether old canoe oars, a set of doors, or pieces of driftwood, can be the perfect texture in a cottage bedroom. Or try wainscot panels, suggests Catherine Pulcine of CPI Interiors. “They’re on the taller side and will give you more of a headboard feeling,” she says. You could also run wooden slats up the wall and continue on the ceiling. “This creates a very modern, canopy look,” says Henry. Even an old wooden fireplace mantel would work—and, as a bonus, you gain a built-in shelf for books and a light. “Painted shutters work wonderfully as headboards, though you can also have a screen upholstered in a pattern at a local fabric shop like Calico Corners,” points out Nixon. 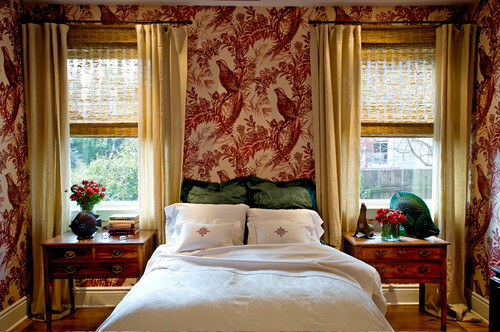 Or try an antique like a chinoiserie screen for a dash of glamour and style in the bedroom. But if you’re shopping for a vintage headboard, bear your dimensions in mind, says Anna Brockway, co-founder and president of Chairish. 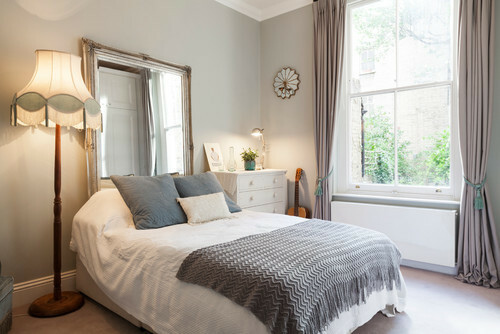 “Mark the desired height on the wall before you buy anything and check the width,” she notes, as older pieces occasionally don’t conform to current bed sizing (e.g., king, queen). Unlike upholstery, which is sewn into new cushions for a permanent overhaul, a removable slipcover fits over an existing piece and can be swapped out anytime for something else. “This change can be had with less expense and lets you shift your look seasonally so your room evolves and doesn’t feel static,” says Nixon. As you consider colors and patterns for a slipcover, think about the tone you want to set. 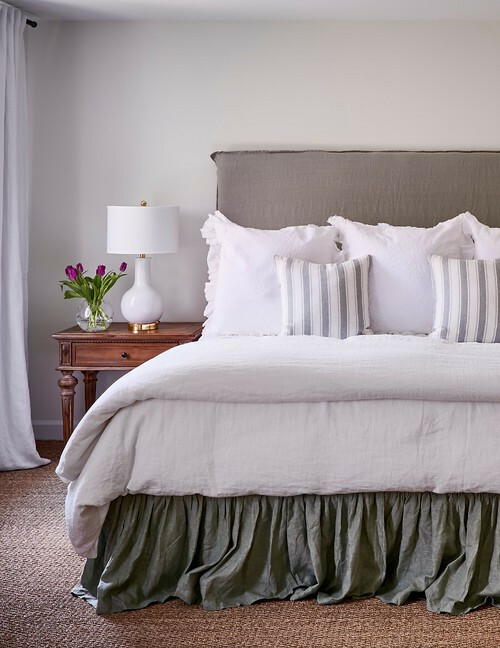 “A bedroom should be relaxing, so stick to cool shades like whites, grays, and natural fibers instead of bright fabrics or prints,” says Henry. Two large photographs, a graphic print, or even an animal hide can also work as a headboard. 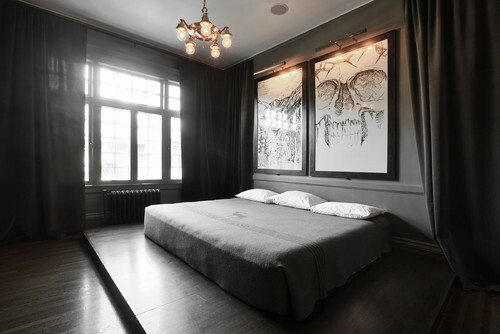 Pro tip: Hire a professional when installing oversize art or a heavy custom design (the last thing you want while sleeping is to have your headboard fall down). Want to keep people from walking on an heirloom rug? 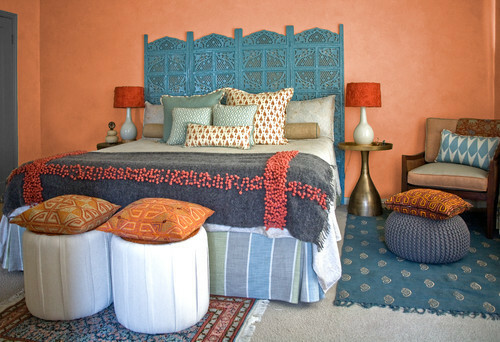 Extend the life of this carpet or special fabric by hanging it up as a headboard. “Tapestries are very in at the moment,” says Pulcine. This idea works well with the boho and eclectic looks that continue to appeal to DIYers and millennials who want to reuse and upcycle home goods. Photo by 38 Spatial, Inc.
Pulcine loves heavily textured wallpaper as a stand-in for a headboard. Add European pillows as a soft backdrop to frame the look. Coordinate your bedding so it complements the wallpaper, but doesn’t compete with the pattern. A mirror is an ideal headboard option as installation is a breeze (lean it against the wall), and it reflects the entire room. “You can also use a window as your headboard, especially with long, sweeping drapes on either side,” says Pulcine. No board? Create the one you want with a bit of paint. This easy, affordable DIY headboard could be the outline of a rectangle or a filled-in shape. And when you’re tired of the color, simply redo it for a new look. The post 8 Headboard Ideas That’ll Perk Up Your Bedroom’s Style appeared first on Real Estate News & Insights | realtor.com®.